Last night Thom and I went to Nightlife, the California Academy of Science‘s weekly Thursday night party, and it was a lot of fun. We sort of went on the spur of the moment and it was sold out online, but they were selling tickets at the door, and thanks to Thom’s membership, we didn’t have to wait long to get our tickets. It was my second time to the new Academy, but my first time in the planetarium. That show (narrated by Sigourney Weaver), which takes you on a short trip through the universe, is pretty amazing. Stuff like that reminds you how vast space is and how small we are. After that we saw a special movie/performance piece called Bella Gaia , which focuses on the Earth, mixing satellite images and data visualizations with the words of International Space Station astronauts. The director was there to present the film; he is also a violinist, and he played violin during the movie as part of the score. And now a blast from the past. 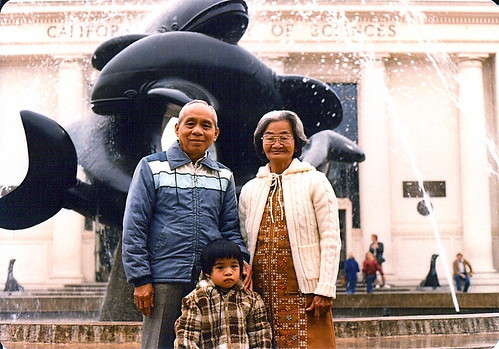 Here’s a photo of me with my paternal grandparents, taken in March 1980 when I was almost three years old, in front of the old Academy of Sciences building. The only things I remember about the old Academy are the circular fish tank and the giant Foucault pendulum. And did they have an earthquake simulator or was that at the Exploratorium? Neat, a photo of mine is being used on a new city guide website called DestinationGuide. 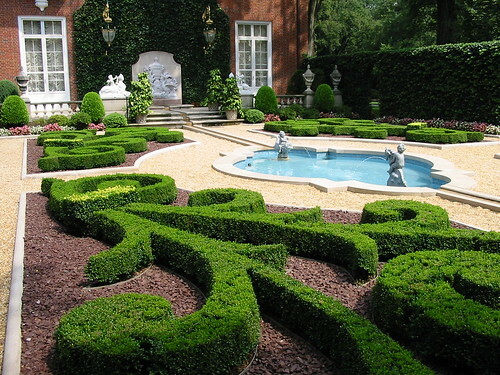 It’s on their page for the Hillwood Museum and Gardens in Washington, D.C. Hillwood, the former estate of Post cereal heiress Marjorie Merriweather Post, is a great place to check out and spend an afternoon if you’re in the area; they even have a Gay Day every summer. By the way, the other day I came across a New York Times article about Washington estate museums, and at the “top of the heap” is Hillwood. More photos from our visit to Hillwood back in August 2005 are up on Flickr.